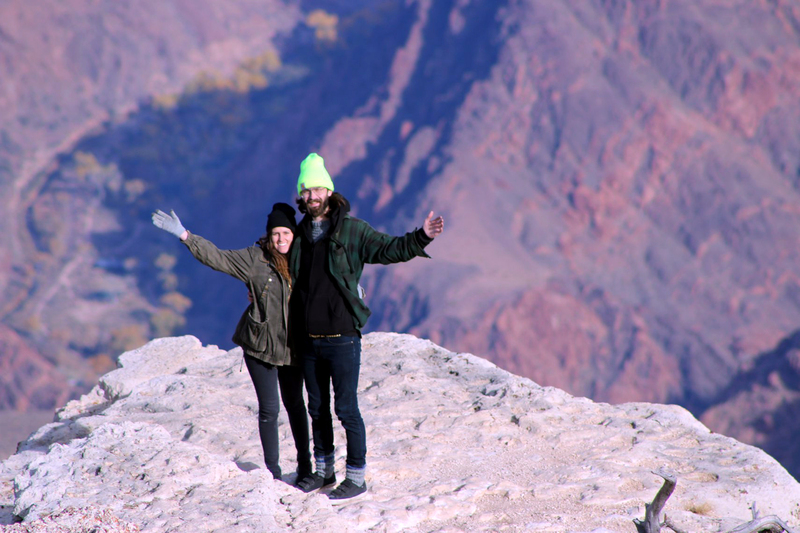 Swapping a Christmas tree for a giant hole in the ground at Grand Canyon National Park. With the provisions for a van-sized Christmas dinner in tow, we set off on the very unassuming drive toward the Grand Canyon. If there were no signs indicating where we were going and you were trying to surprise me, you wouldn’t even need to blindfold me. It felt like we were driving through Ontario with tall boreal-lookin’ trees, rich non-desert-sand soil and snow on the ground. Definitely not what I expected for what the surrounding area would look like, but that always made the surprise that much more exciting. Also, the snow and chill in the air helped to make it feel a lot more like Christmas! I was really set on exploring the North Rim and stoked to park just metres away from the edge until I learned that the roads to the North Rim are closed for the winter. Womp womp wooooomp! Luckily, the South Rim is still ridiculously cool. This is the part that most tourists get to see so there are plenty of parking areas and whatnot nearby. Being the end of December, it was still pretty packed but not too overcrowded to enjoy. It’s hard to articulate how crazy it is to drive into a wooded area and then walk barely 10m to see that thing. I don’t think we were expecting it to be that cool but we sincerely recommend checking it out at some point in your life, if you haven’t already. We climbed onto a rocky peninsula and relished in how small we felt in the crazy landscape that surrounded us. Another thing we felt was hungry since we hadn’t eaten all day and just scaled our way into a canyon. We met plenty of interesting folks in the parking lot that all seemed to come out of nowhere like some weird mirage – guess we were hungrier than we thought. We stayed to watch the sunset and immediately felt the absence of the sun as the temperature dropped significantly. We headed back to Tusayan, where we were staying for a few days, just outside of the park’s entrance. We spent Christmas Eve binging on The Great British Bake Off and spending time with Justin’s parents. 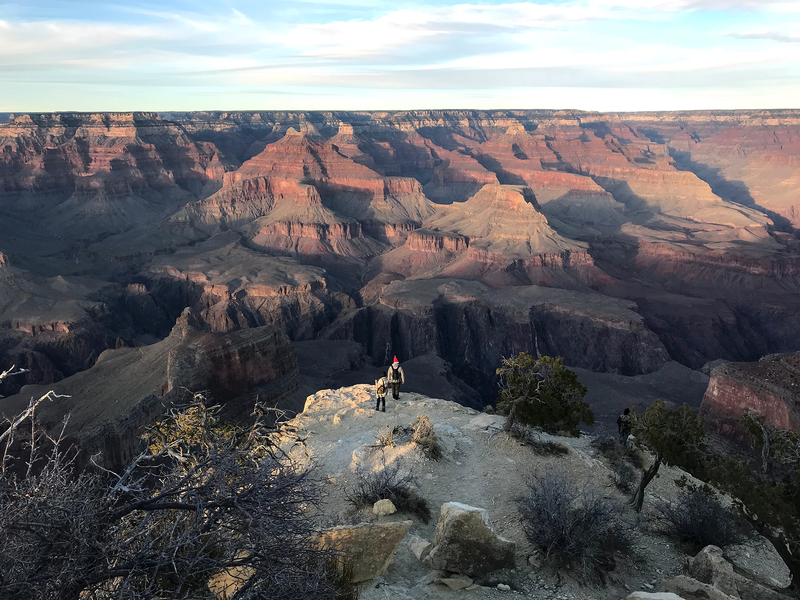 After doing our Christmas morning shindig, we cooked up a delicious holiday feast – complete with a tiny turkey – and made our way back to the canyon to enjoy some different views as the sun was packing it in for the day. Despite being a drag that you can’t drive along the North Rim in the winter, it’s super awesome that the road to Hermit’s Rest is open to regular vehicles in the off-season. Driving along the edge of the cliffs is a trip!! There are so many cool spots to pull over and see the landscape from a different perspective. Our favourite was Powell Point, where you can walk down onto a peninsula and be surrounded by canyon on both sides. It’s a pretty cool feeling that again, is very hard to put words to. As we were just about done filming a time-lapse of the sunset, a guy came over and complimented Clemmie and told us he’s also a vanner. 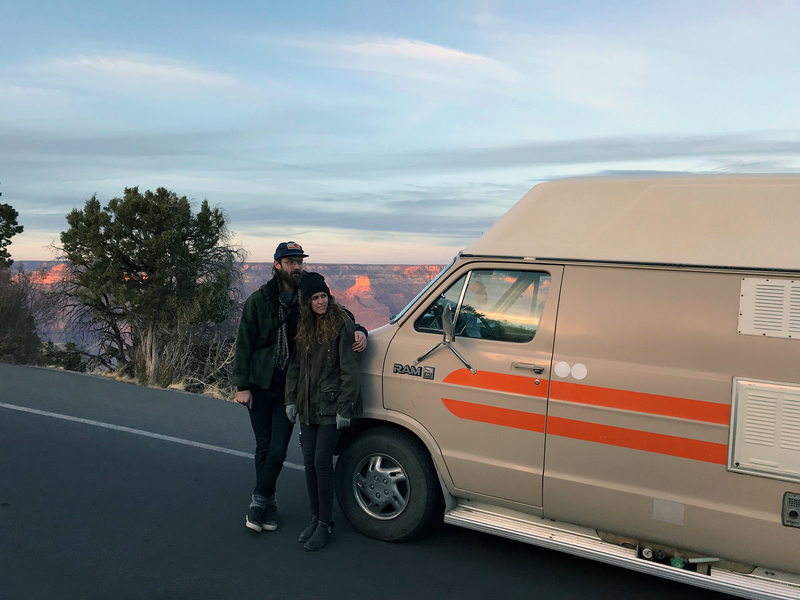 We shared proud parent stories about our vans when he told us that he had slept at the bottom of the canyon that night. We had heard of this but didn’t know if it was possible in a rig like ours. It’s top on our list to do next time we’re in the area and sounded like an amazing drive. 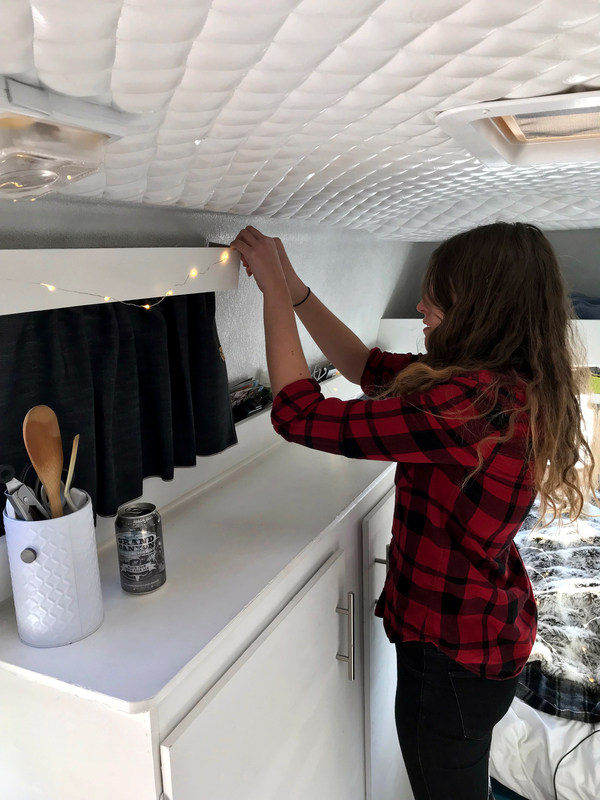 As our new friend explained how to drive in, we realized that the turn-off is right by Peach Springs – a ghost town on Route 66 that we stayed near while boondocking in Kingman! It seems that we had literally driven past this magical road and didn’t even know it. For anyone interested, you must visit the Hualapai Lodge, just east of Peach Springs to get a permit (the last bit of the drive puts you on Native Land so you need the permit to enter). From the Lodge, you just carry on Diamond Creek Road until you reach the Colorado River and set yourself up from there! He said we’d be fine with rear-wheel drive but some other stories I’ve read might suggest otherwise. 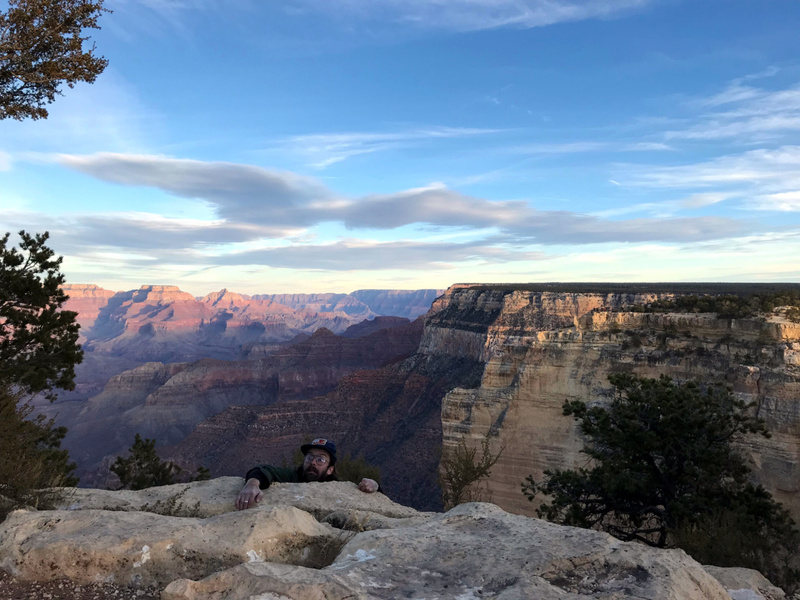 We’ll have to find out for ourselves one day – if blog posts cease to be posted after this then yes, we’ve gotten stuck in the sands of the Grand Canyon. Sitting along “The Abyss” – only a 3000′ drop below. That’s cool. Not scared. Our first Christmas in the van was awesome and we hope for many more to come. We were lucky enough to spend it with some family and found good enough Internet to FaceTime in with the others. Even though the snow was pretty for Christmas but we’re satisfied. We are heading south! 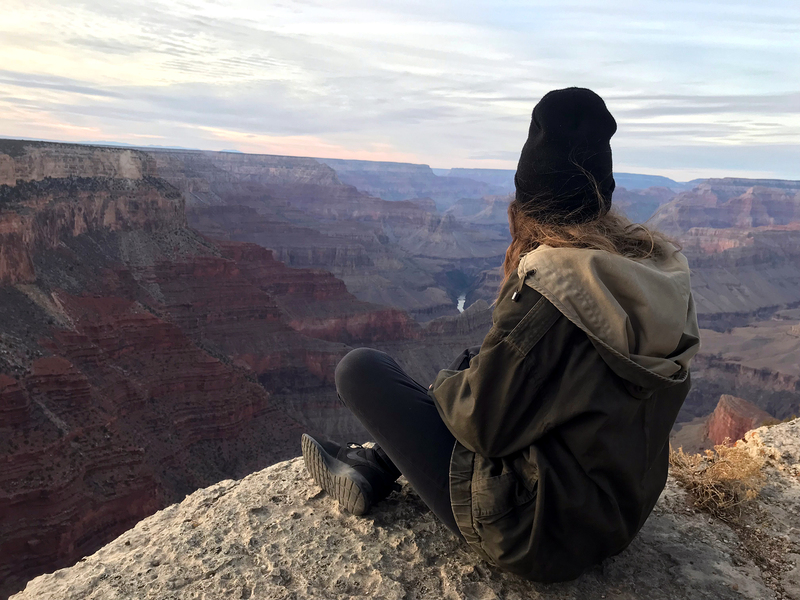 Hit us up in the comments with your experience camping at the Grand Canyon if you’ve ever done it – we’d love to put it on our roster.